This cute little 5″ x 3″ card was made with the CTMH #30yearsofhappy September promotional stamp set (see below on how you can get this set for FREE!). All of the patterned papers were from the Chalk It Up school-themed paper packet. The sketch inspiration for this card was from the Mojo Monday Challenge #362, found here. I inked around all of the papers with their corresponding ink colors (Lagoon and Sorbet) and then layered the papers, following the Mojo Monday sketch. The “Rockstar” sentiment came from the #30yearsofhappy stamp set, and was adhered to 2 sunburst pieces that I cut from the Cricut Art Philosophy cartridge. 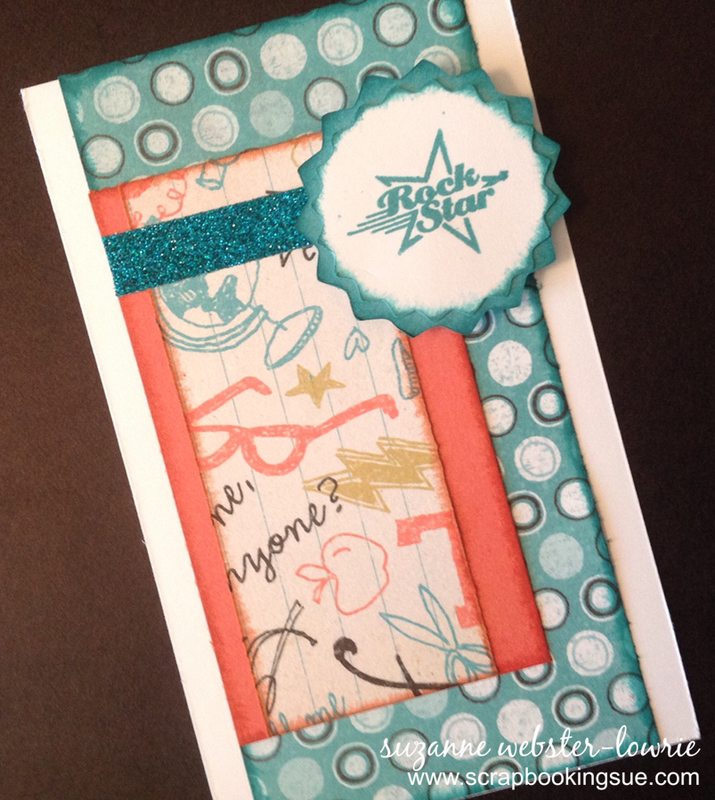 To finish off the card, I added a small piece of Teal Shimmer Trim to the top for some Rockstar sparkle! For the month of September, you can get the CTMH #30yearsofhappy stamp set for FREE! This set of 30 mini stamps commemorates the 30 years that Close To My Heart founder and CEO, Jeanette Lynton, has been in the stamping industry. When you spend only $30 on current, retail-priced stamps, this set is yours for FREE! You can check it out here. Set of 30 Stamps FREE! FREE Cricut Collection for Montana Residents!